Deep within the glowing cloud of the HII region LHA 120-N 180B, MUSE has spotted a jet emitted by a fledgling star — a massive young stellar object. This is the first time such a jet has been observed in visible light outside the Milky Way. Usually, such jets are obscured by their dusty surroundings, meaning they can only be detected at infrared or radio wavelengths by telescopes such as ALMA. 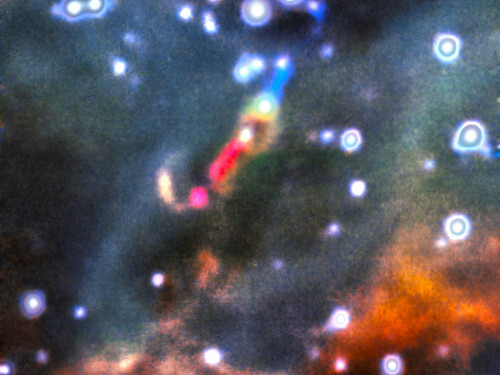 However, the relatively dust-free environment of the LMC allowed this jet — named Herbig–Haro 1177, or HH 1177 for short — to be observed at visible wavelengths. At nearly 33 light-years in length, it is one of the longest such jets ever observed. The blue and red regions in this image show the jet, which was detected as blue- and red-shifted emission peaks of the Hα line.